Imagine your 10-year-old daughter is involved in a high-dive competition. She's past the point of participation trophies and genuinely wants to win. She performs as cleanly as she can, but the judges' scores are not as high as the other girls. Ultimately, she goes home with nothing and is devastated. How would you respond to her? A. "Well I thought you were the best of all of those girls." B. "It's OK. We'll get 'em next time." C. "Those girls were better than you, which is why you didn't win." What if I told you that two of the three responses above could be detrimentally affecting your child's academic future? Of course, in the moment, you just want to console her. And I get it. I'm a father of two. When my kids are sad, I'm sad. I hate seeing them in any pain, and it's our natural parental instinct to provide a quick remedy. Still, the first two responses, even with the best intentions, have one common negative thread. In fact, I argue the third response will actually best prepare your daughter for future academic success. The fact that you likely connected with it the least magnifies a growing problem many of us in the educational field are witnessing in our classrooms. I am a scientist, and when I first found out my wife was having a baby, I did what any scientist would do. I researched. I read every parenting and baby book I could get my hands on, and what I've realized is that there are a lot of experts who tell you to do completely different things. But if we begin to consider how our actions affect the way our kids view challenge and risk, it's amazing the impact we can have on the development of our children's academic reasoning. Anyone with children can attest to the fact that our kids are constantly trying to challenge themselves, get their hands on new toys or attempt to climb up or jump off of something higher or further than ever before. In fact, much of our job as parents is to protect them from harm by being that filter that they don't yet have for themselves. Of course, we don't want our kids to incur great physical harm. But what if our idea of protection has in fact trained our kids to fear the world around them more than embrace the adventures it offers? In the world of education, the term Helicopter Parent has become quite well known. In essence, these parents hover over their children, constantly pressuring them to accomplish tasks to perfection. A newer, and in my opinion, more damaging parenting style has developed over the past decade and become kindly known as Lawnmower Parenting. These are parents who constantly clear all obstacles from their children's paths so they never have to deal with problems for themselves. These parents mean well. They don't want to see their babies suffer. But I argue that this consistent response to our children's struggles causes two serious problems. First, our kids are becoming increasingly entitled, thinking that everything comes easily. They simply expect things to always work out for them with minimal effort. Because of course it always has in the past. With the first two responses to the high-dive scenario, it's easy to react by telling her you thought she was great or that things will somehow be more successful the next time without doing anything differently. Although common, and I've said both myself, the first two responses accomplish the same goal; they deflect the failure for the child. 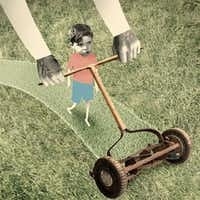 When confronted with an obstacle, the lawnmower parent will choose to distract the child so as not to suffer the sadness that may be associated with the loss. Repeating this cycle portrays a false reality that children deserve and should expect every reward this world has to give. Second, because our kids grow up without experiencing much or even any failure in their lives, they have no coping mechanisms to overcome adversity. This puts teachers in an especially awkward position because our role is to present obstacles for kids to overcome. And often, when confronted with these obstacles, because of their inexperience, they freeze up, put up a wall. And now we teachers are responsible for building experience with adversity and breaking down that wall. We can do it, but we need parents' help. If parents continue to lawnmower and insist that we teachers serve as their lawnmower liaisons in the classroom, nobody wins. But if we all recognize the need to let kids struggle in a safe, recoverable environment, we can all work together to best prepare them for an increasingly unapologetic world. Of the three reactions mentioned earlier, only the third forces the child to focus on her role in that particular failure. Granted, there could be other factors at play that are out of her control. But encouraging this discussion helps her brush it off, learn from the experience and continue to improve toward accomplishing the goal. That goal is now more attainable because of her deliberate focus. 1. What role did I play in this particular failure? 2. What could I have done differently to be more successful? 3. How can I learn from this experience?